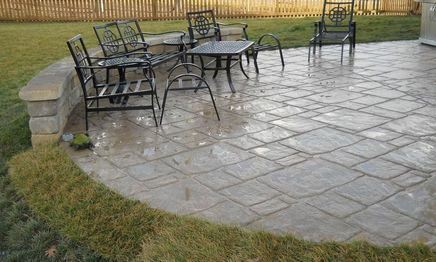 In search of a stamped concrete contractor to install that patio you've always wanted at your home here in Hampton, Virginia? We don't just repair and resurface driveways but also do overlays, pool decks, slabs and much more. Would like to inquire about services our company offers? Reach out at (757) 347-8337 and ask away. We proudly provide free cost estimate on every project. We also install paver patios, imprint and replace existing work. Looking for a reliable concrete company in Hampton, VA? If so, then you've probably noticed that you have a few different options. You will want to explore these options so that you can find a company that offers everything you need. Do you know someone that has had to hire a contractor in the past? If you do, you may want to ask them to give you a recommendation. If they are able to recommend a service to you, you'll be able to find one that suits your needs. Most people are more than willing to share recommendations if they have had a positive experience with a company. If someone you know has had a negative experience with a local company, you'll want to listen to their feedback as well. They may be able to tell you which companies you should avoid. Working with cement can be complex. Because concrete can dry quickly, you'll have to make sure that you work with someone that knows what they are doing. If they make a single mistake, there may not be time to correct it. You should make a point of hiring a company that has been working with concrete for a very long time. If you hire a company that has plenty of experience, then you'll be able to trust them with this job. You'll know that they will do what you need them to do. You should try to find a company that does quality work, but you should also try to work with one that charges reasonable rates. There are plenty of companies in the area you can choose from. It's a good idea to contact a few different Hampton companies that work with concrete. Tell them about the job and ask them for a price quote. Be sure to find out what that estimate includes. Once you have a few estimates, you'll be able to compare them. From there, you will be able to find the best available deals. If you need to get your problem resolved right away, then you're going to have to connect with a company that will be able to get to your job in a timely manner. You should try to find a company that can work with your schedule as well. When you speak to different professionals, you should ask them about their availability. You should see when they will be able to start the job, and you should find out when it will be finished. When you are going to be working directly with a company like this, you'll want to make sure that they work hard on your behalf. You should try to find a company that makes customer service one of their top priorities. You should also look for a company that will be willing to communicate with you. Customer service is important when it comes to jobs like this. You want a company that will work hard to help you. You also want to make sure you can get in touch with the cement service provider whenever you need to. Are you interested in finding the best option in Hampton? Once you explore your options and follow these tips, you'll be able to find companies that are worth hiring. You'll be able to get all of your concrete needs taken care of.